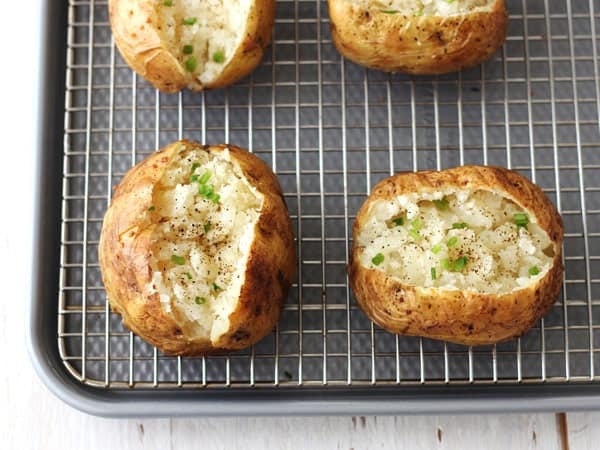 Your ultimate guide for making crispy skinned and super fluffy toaster oven baked potatoes. Enjoy one tonight! Nothing beats the comforting feeling you get from digging into an overstuffed warm and fluffy baked potato. Whether it’s the middle of a summer heat wave or the dead of winter a wholesome classic baked potato can always be on the menu thanks to your toaster oven. 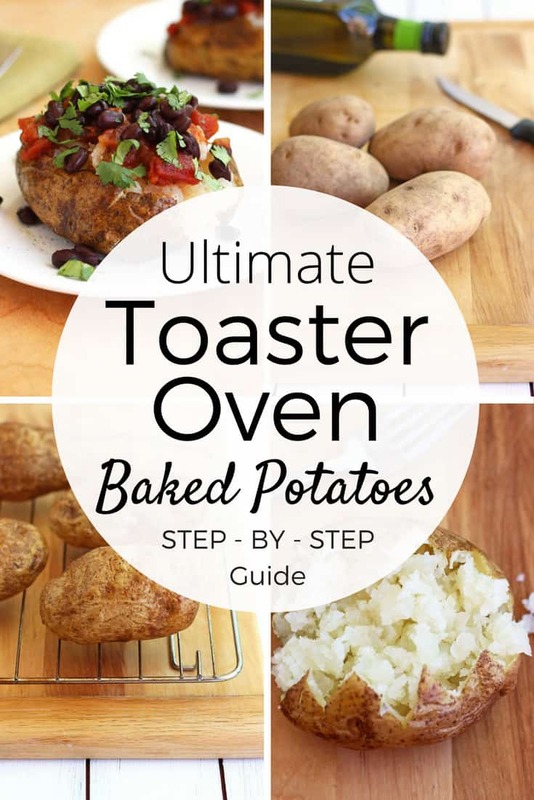 Baking potatoes directly on your toaster oven’s rack will allow the heat to move more evenly around the potatoes. But if you’re lightly oiling your potatoes for a crispy skin you will get oil in the bottom of your toaster oven. 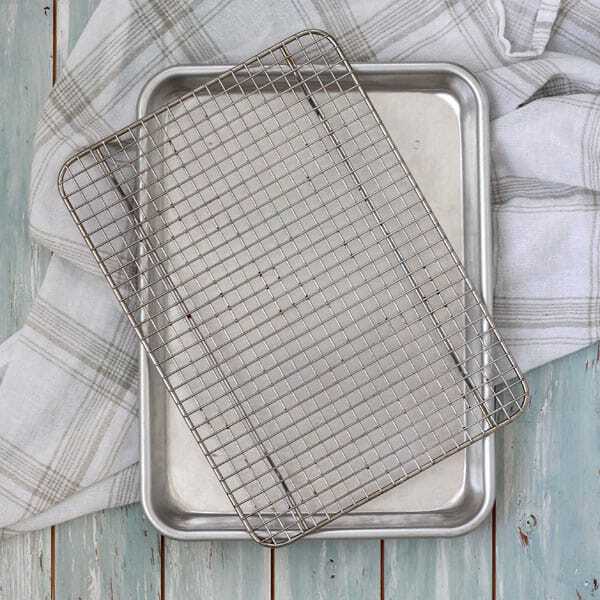 For easier cleanup, we recommend using a baking sheet + rack combo. The Chicago Metallic Set (affiliate) has a rack and pan that will fit in most small and medium-sized toaster ovens and can accommodate two large potatoes. It’s also awesome for cooking sticky toaster oven baked sweet potatoes. If you have a larger toaster oven like our dreamy Breville Smart Oven Pro (affiliate) you can use a rimmed 1/4 sheet pan (affiliate) with a small oven-safe baking rack (affiliate) that is rated safe up to at least 450 degrees. This combo fits 4 large or 6 small to medium potatoes. You’re a smart cookie who’d never put foil or parchment paper in the bottom of your toaster oven. Placing anything near the heating elements in a toaster oven can cause a fire. But, if a fire ever does start, turn off your toaster oven and keep the door closed until the fire has burned out. And always call 911 if you think it’s necessary. 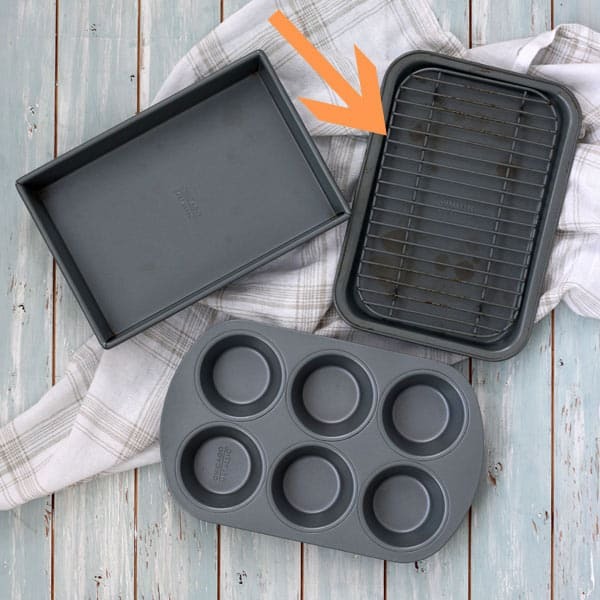 Remove your toaster oven’s cooking rack or grab a baking sheet and place a cooling rack inside of it if available. 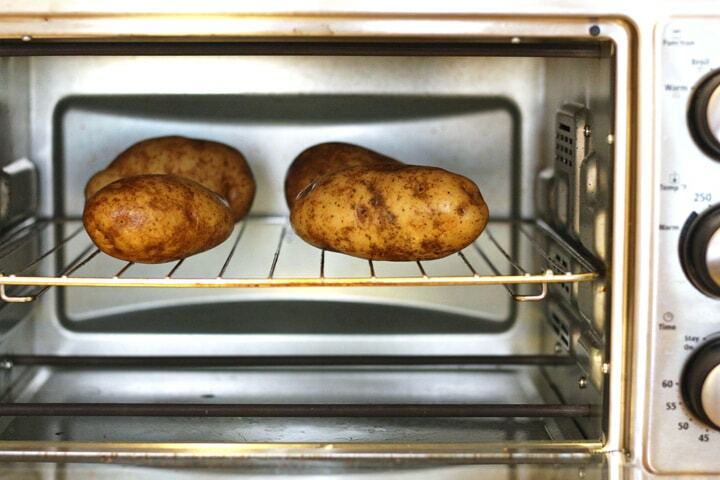 Preheat the toaster oven to 400º F. Wash, scrub and dry 4 medium sized Russet potatoes. 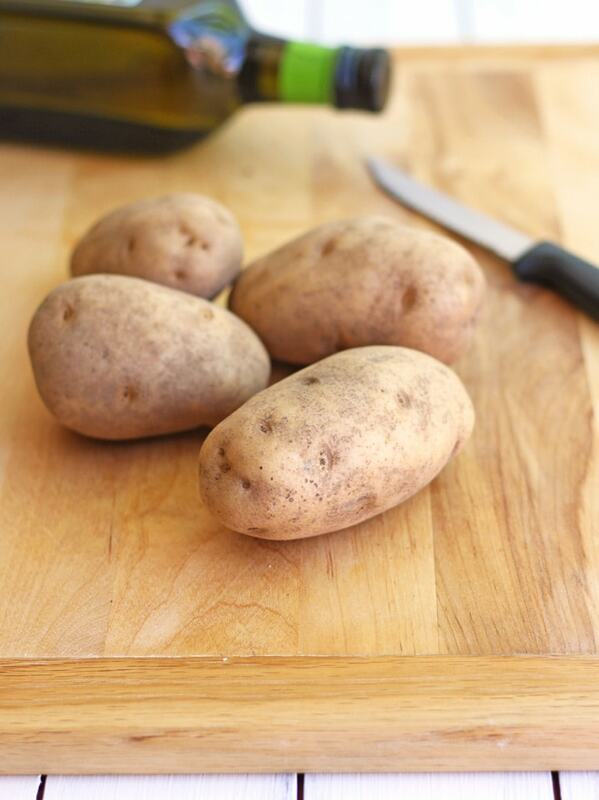 Using a small steak knife or fork, carefully stab each potato 2 times on each side. You are only trying to pierce the potatoes centers not have the knife/fork go through to the other side. If the steam can’t release the potato could explode in your oven. Ditch the foil unless you want to steam not bake your potatoes. Steaming will mean no crispy skin. Rub each potato with a thin coating of olive oil (about 1/8 to 1/4 teaspoon) and place them on the toaster oven baking rack or cookie sheet you prepared earlier. Return potato topped rack to the preheated toaster oven and bake potatoes at 400º F for 45 minutes to an 1 hour or more for larger potatoes. Depending on their size your potatoes may take more or less time. Start checking for doneness around 40 minutes for smaller potatoes. The potatoes will feel tender when squeezed, a knife or fork will go in easily and the skin will be lightly browned and crispy to the touch. Remove the cookie sheet or use tongs to remove the individual potatoes. If you’re cooking directly on your toaster oven’s rack it’s safer to carefully remove the whole rack instead. Woo-Hoo you’re almost done…the last step is to fluff those taters! 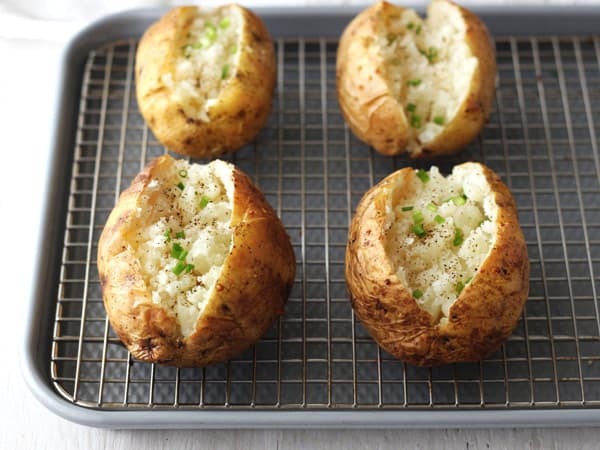 Getting the steam out of your just baked potatoes is crucial to keep them from getting soggy. Simply slice each potato open lengthwise and fluff the flesh or try the methods below. 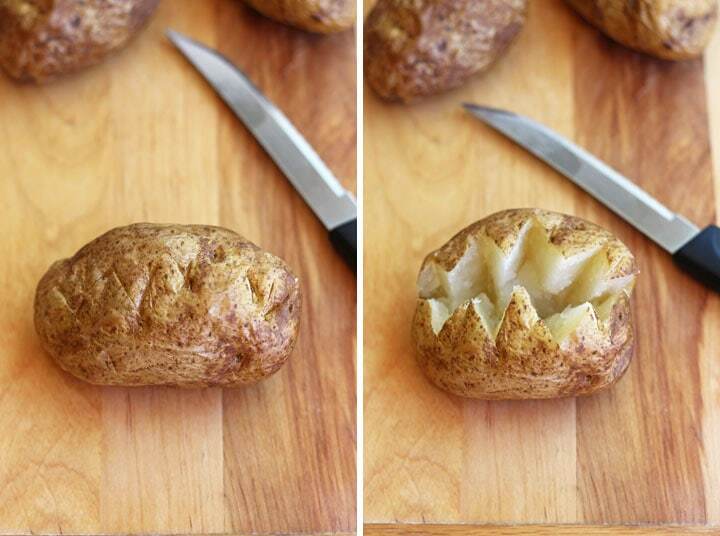 Use a steak knife to cut a zig-zag pattern across the length of the potato. Put your thumbs on each end of the potato and press towards the center. The potato will pop open (watch out for steam) and you can fluff the interior with a fork. A thwacked potato looks rustic and it’s super fun. Surprisingly, we learned this play-with-your-food idea from Martha Stewart. Hold the potato lengthwise in your hand and with medium force thwack it once or twice against the counter or a cutting board. This fluffs up the potato flesh and cracks them open. Want to Cook Them Faster? By using your microwave you can cut the cook time in half. Start by preheating your toaster oven to 450 F and skip the oil for now. Wash, dry and stab your raw potatoes. Then microwave them for 5 to 10 minutes flipping halfway through the cook time. Allow potatoes to cool for a few minutes and then lightly rub with oil. Bake potatoes directly on the toaster oven rack or rack/pan combo for 20 to 30 minutes until they are knife tender and have a crispy golden skin. Want to Cook Them Faster Without Using The Microwave? 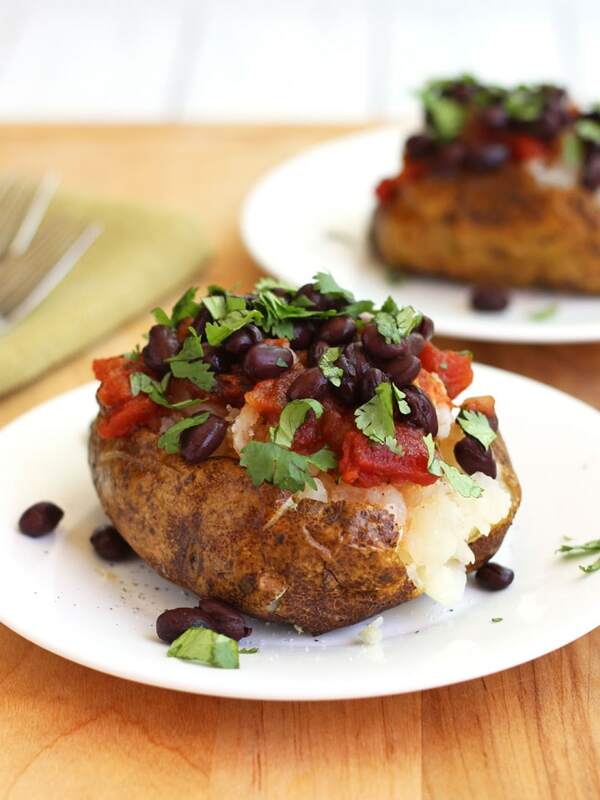 Check out this post for Quick Baked Potatoes! With one simple change, you can bake potatoes that are fluffy and ready for topping in just 30 to 35 minutes without having to use your microwave. Follow the steps above but reduce the temperature to 375F and begin checking on your potatoes about 20 minutes earlier than you normally do. Flipping them halfway through the cook time led to the even browning of the skin, but it’s not essential for a tasty baked potato. 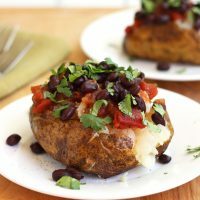 Like with a conventional toaster oven, you are looking for the baked potatoes to be crispy outside, knife/fork tender and give when you squeeze them in the middle. It took us about 40 minutes for 3-4lb potatoes and about 50 minutes for 4-5 lb potatoes. Larger potatoes may take an hour or more depending on their size. You can speed up the cook time a little by increasing the temperature to 400F with the convection but watch out for over-browning of the skin. Also, if you find your potatoes have a dense/hard layer under the skin they are getting overcooked and you’ll want to go with the lower temperature next time. Classic restaurant style with butter, sour cream and chives is always a winner. But maybe you’re craving something a little different and more substantial? If that’s the case, whip up a batch of cheesy creamy Southwestern Twice Baked Potatoes. Don’t forget about your leftovers! Extra roasted veggies make great baked potato toppers, especially Jalapeño Roasted Cauliflower, Roasted Zucchini and Tomatoes, Balsamic Asparagus, and even Brussels Sprouts. Refrigerate leftover baked potatoes within two hours of baking in a covered glass container. They should stay good for up to 3 or 4 days. Place the whole potato directly on the rack in a preheated 350 F toaster oven and cook for 20 to 25 minutes until warmed through. Slice the baked potato in half and place on a microwave-safe plate. Microwave for 3 to 4 minutes until warmed through. For a premium experience, place a lightly moistened paper towel over the potato halves before microwaving. 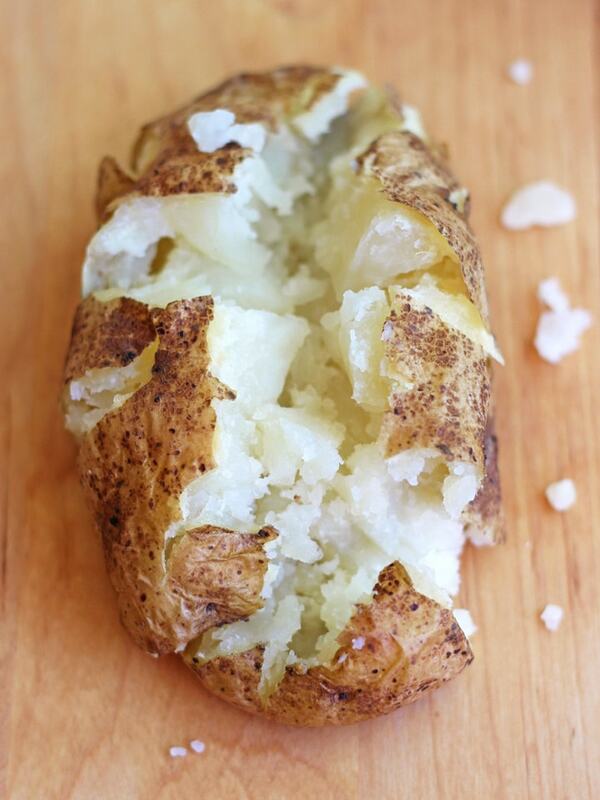 According to the FDA refrigerating baked potatoes in foil creates a dangerous environment that can cause botulism. Since baking in foil leads to soggy skins anyway it’s probably best (for safety and flavor) to keep foil away from your toaster oven baked potatoes entirely. Well you know a basic recipe, have seen step-by-step directions, can bake your potatoes quicker, have a bunch of toppings ideas swirling in your head and you know the best ways to store and reheat your extras. Now all that’s left is to Go Forth and Bake…Potatoes! 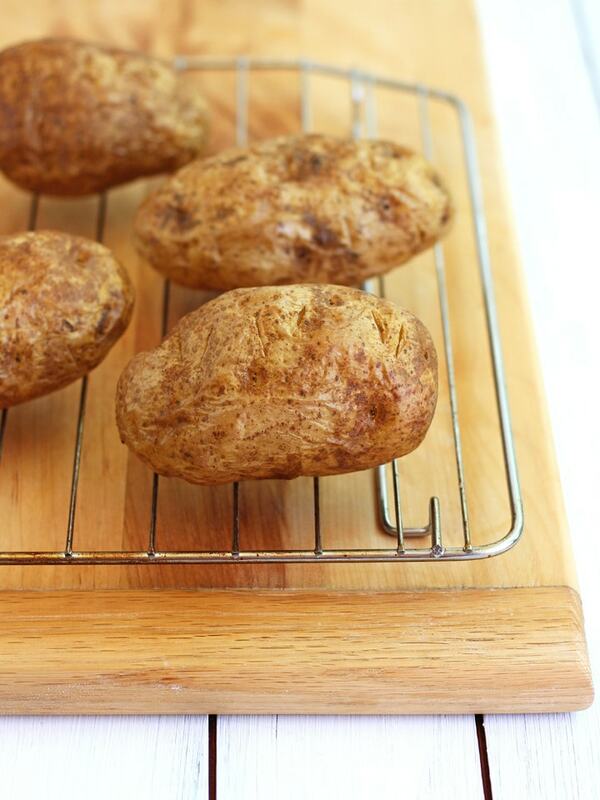 Cook crispy skinned and super fluffy baked potatoes using your toaster oven! 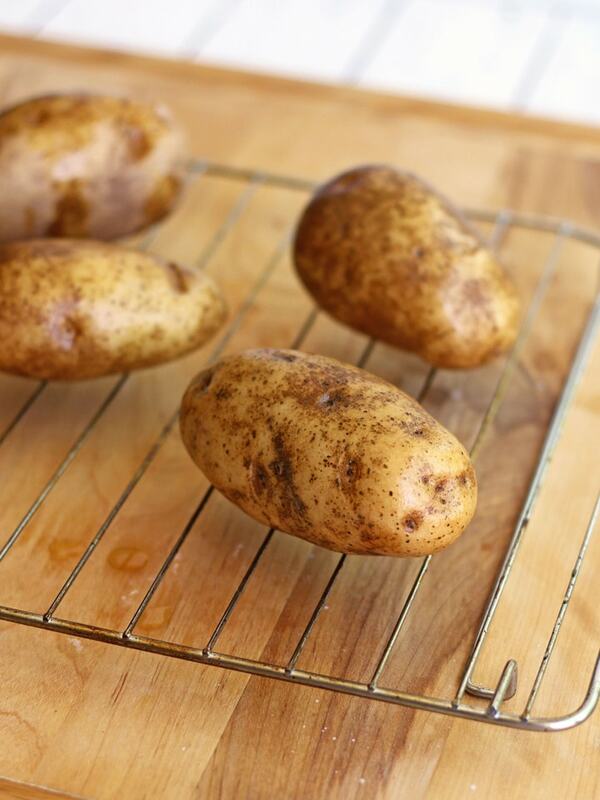 Remove baking rack and preheat toaster oven to 400 degrees F. Wash, scrub and dry 2 medium-sized Russet potatoes. Using a fork or small steak knife carefully pierce each potato 2 or 3 times on each side. Rub potatoes with a thin coating of olive oil (about a 1/4 teaspoon) and place potatoes on toaster oven baking rack. Return potato topped rack to the preheated toaster oven and bake potatoes for 45 minutes or until potatoes feel tender and soft when pierced with a fork and their skins are lightly browned and crispy to the touch. Cut a zig-zag pattern across the length of the potato. Put your thumbs on each end of the potato and press towards the center. 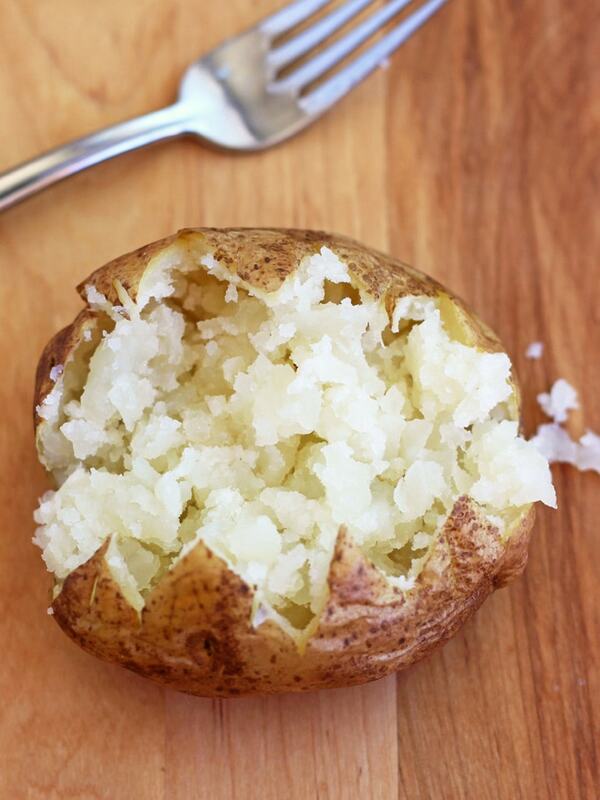 The potato will pop open (watch out for steam) and you can fluff the interior with a fork. Serve with salt, pepper and your favorite toppings. Depending on their size your potatoes may take less or more time to fully cook. Start checking around 35 to 40 minutes for smaller potatoes. Preheat your convection toaster oven to 375 F and proceed with the steps above. Begin checking for doneness early. Thanks for this recipe, just what I was looking for. I like to use the toaster oven instead of the regular oven so I’m glad I found your site. Should you still cut them if you are going to reheat them later? Great question Meghan! It’s really up to you and your preference. I usually open and fluff all of our potatoes and just pack up the leftovers. If I’m purposefully cooking extras for later I don’t open them unless I’m want to stuff each one with cheese and veggies before storing. Open or closed, they still taste yummy. Nothing beats a good baked potato! So simple and completely satisfying all the time, everytime I make some, I keep wondering why am I actually not making them more regularly.